Kickstarter vs Indiegogo: Which Crowdfunding Platform Should You Choose? There are plenty of crowdfunding platforms to choose from but the biggest platforms are undoubtedly Kickstarter and Indiegogo. On the surface, both platforms are very similar. They provide a marketplace for crowdfunding and both take 5% of your campaign earnings, but beyond the surface, there are actually many differences between them. Let’s go over the major ones. Kickstarter has the bigger platform with nearly $2.7 billion raised from 11.8 million backers since the company started in 2009. Indiegogo has raised over $800 million from 2008 to 2015, which is much lower than Kickstarter. 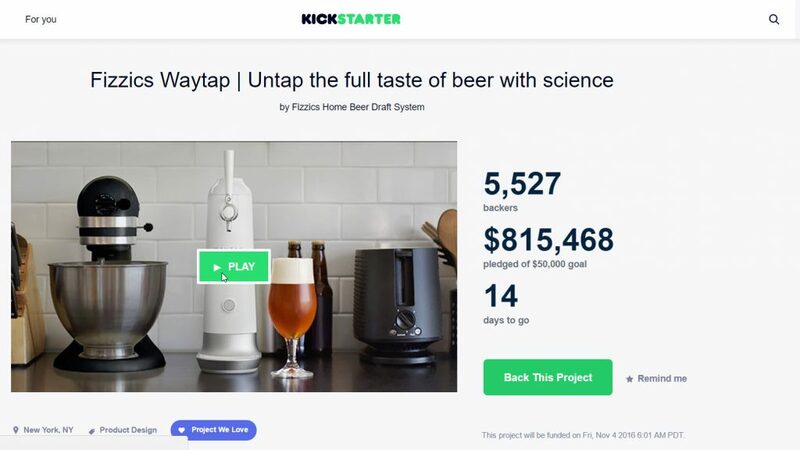 While neither Kickstarter or Indiegogo reveal traffic numbers, The Crowdfunding Formula estimates that Kickstarter amasses between 25 to 27 million unique monthly visitors compared to 9 million for Indiegogo. The takeaway: Kickstarter is the bigger platform, but that doesn’t mean you should dismiss Indiegogo. Indiegogo has other strengths that we’ll delve into further down this list. Kickstarter makes it easier to look at its stats to see what its success rate is, but Indiegogo is doesn’t divulge any data about its campaigns and earnings. However, there are sites that can scrape whatever available data about each platform to help us get a rough estimate for each platform. Kickstarter’s success rate is around 35% while Indiegogo’s estimated to be around 17% according to Art of the Kickstart. This seems damning for Indiegogo, but you have to consider that its platform is more open to a variety of projects. Plus, Kickstarter does more to vet projects before they go live on their site, where as Indiegogo is more relaxed, which means companies using Indiegogo may not be as prepared as companies on Kickstarter. The takeaway: Kickstarter has a higher success rate because of its quality control and more selective process. Indiegogo is a more open platform where new, inexperienced companies flock to and fail, lowering the platform’s overall success rate. Kickstarter and Indiegogo may both be crowdfunding platforms, but he types of campaigns vary between the two. For example, Indiegogo started life as a place for independent filmmakers to find funding to bring their films to life. It eventually evolved to include just about everything, but Indiegogo’s roots are cemented in the film and entertainment industries. For example, Indiegogo helped fund the comedy Super Troopers 2. Kickstarter also features a variety of projects and products, but their most popular categories are gaming and technology. Pebble, the smartwatch maker, started life on Kickstarter and continues using the platform to this day to raise money for its wearables. Pillars of Eternity, a popular role-playing game, was also funded on Kickstarter. The takeaway: Before deciding on which platform you want to host your campaign, think of the differences in audience between Kickstarter and Indiegogo. Kickstarter is a powerhouse for games. Indiegogo is more tech and film focused. While Kickstarter has a larger platform, it’s only available in 18 countries. Indiegogo, on the other hand, is available in over 200 countries. If your campaign has an international appeal, Indiegogo may be the better platform. The takeaway: Indiegogo offers more options for international campaigns. Kickstarter only offers fixed funding, which means your company only receive money after the campaign is successfully funded. If you fail to reach your funding goal, all money pledged with go back to its backers. Indiegogo on the other hand, offers both fixed and flexible funding. Flexible funding is where campaigns receive money from backers regardless of whether or not the campaign reaches its goal. Flexible funding lets you get your campaign off the ground faster, as you can start using the money and working on your project without having to wait a month for the campaign to wrap up. But there are risks involved for both backers and companies with flexible funding. With flexible funding, you may find yourself in a position where you didn’t raise enough capital to get your project off the ground, but backers have already given you money. If you cannot get your project off the ground with the capital you have, then you have a moral obligation to refund the money to your backers, and paying out of pocket for the Indiegogo and payment fees. The takeaway: Before you decide which method of funding is for you, decide whether or not you can get your project off the ground if you campaign doesn’t reach its goals. Be prepared for failure and always have a backup plan. Both Kickstarter and Indiegogo charge a flat 5% platform fee, whether or not your campaign gets funded. Then you’ll have to add on payment fees. PayPal charges between 3-5% while traditional credit cards charge a flat 3%. Fees can change depending on where your company is located to head over to Kickstarter’s fee page to see what fees are applicable to your country. For Indiegogo, there’s an additional $25 wire fee to transfer USD earnings to a non-US bank. For more, check out Indiegogo’s fee breakdown. The takeaway: Both Kickstarter and Indiegogo share the same 5% flat rate for campaigns, whether or not they get funded. Don’t forget to factor in the credit card and PayPal fees! Kickstarter is the bigger crowdfunding brand, for now. As mentioned before, Indiegogo is roughly a third of the size of Kickstarter. By virtue of its size and the company’s vetting of projects, Kickstarter is covered more in the press. This is something you have to consider when you’re planning your marketing strategy for your campaign. Paid advertisements should be part of your overall marketing budget, but you shouldn’t underestimate the power of word-of-mouth. You should also be ready to address any skepticism about your project well before the launch of your campaign, otherwise it could prove disastrous. The takeaway: Kickstarter is covered more by the press, which will help your campaign spread. Kickstarter’s more stringent vetting helps cut out ill-prepared campaigns, making it easier for the press to find compelling products and stories to share. However, press coverage is not guaranteed, so you’ll need to have a media plan in place before your campaign goes live. Video is an important part of convincing backers that your product is a good one, but where do you host your videos? With Kickstarter, video hosting is provided. This means you don’t have to worry about where to upload your video and what audience to tailor it for. Kickstarter will handle all of that for you with easily shareable and embeddable videos. Kickstarter offers its own video hosting so you don’t have to worry about using a third-party platform. Indiegogo doesn’t provide video hosting of its own, but it does support YouTube and Vimeo. You’ll have to think about which platform you want to pick. Vimeo is a video platform with higher quality content, but you’ll likely have to pay for a pro account if you plan on uploading a bunch of video. YouTube is free, but you’ll also have to fight to get noticed since there’s so much content on that platform. You should also consider which platform will provide a good platform for discussion about your project. Both Vimeo and YouTube both support comments that can show up on your Indiegogo campaign page, but you have to know where your prospective buyers will most likely congregate. If you want to appeal to the creative type, Vimeo may be a better option. If you want to appeal to more of the general public, YouTube is the platform for you. The takeaway: Since Kickstarter offers its own video hosting, it gets a slight edge over Indiegogo here. However, Indiegogo’s use of YouTube and Vimeo allow watchers to comment and engage with your video. Kickstarter is currently limited to only one payment option: Stripe. This lets users use their credit card numbers to pay for a pledge, but there’s no support for easy mobile payments like Android Pay or Apple Pay. For more information about credit card payments via Stripe, head over to Kickstarter’s backer FAQ. Indiegogo on the other hand, supports a variety of payment options for backers, including credit cards, PayPal, and Apple Pay. By offering both PayPal and credit card payments, Indiegogo observed a 28% increase in contributions. Offering more payment options makes it easier for backers to commit to a project without jumping through a series of hoops just to pay. Indiegogo gets the edge with payments because of this. The takeaway: Indiegogo offers more payment options for backers, which makes it easier for them to contribute to your campaign. Kickstarter needs to work getting more payment options on its platform. In order to run a successful crowdfunding campaign, you’re going to need all the data you can get. Kickstarter offers Google Analytics integration to help you quickly see information about funding, top referrers, reward breakdowns, even a continuous feed of all project activity. A preview of Kickstarer’s Google Analytics dashboard. Indiegogo provides a bit more data to campaigns with the ability to track Facebook and Google ads. This data is invaluable for your ad spending, as you can optimize your ads instead of spending loads of money hoping your ads work. Kickstarter also has a limitation in Google Analytics where traffic and pledges from its mobile app aren’t distinguished from other traffic, making it impossible to monitor exactly where traffic and conversions are coming from. Here you can see the limitations of Google Analytics integration with Kickstarter. The data shows how many people converted, but doesn’t show you exactly where or how they bought your product. One final thing to consider is that Kickstarter won’t give you a list of backers until your campaign ends. Indiegogo gives you access to your backers list immediately, so you can tailor your email marketing campaigns effectively. For example, you can send follow up emails to people who have already backed your campaign, separate from the ones who haven’t committed yet but that you’d like to convert. The takeaway: Indiegogo’s inclusion of Facebook Pixel and Google Adwords tracking is invaluable for your ad spend. Both platforms need work integrating more data, but the edge goes to Indiegogo for now. Both Kickstarter and Indiegogo have their pros and cons, and ultimately, it’s up to you to decide which pros and cons matter to you most. Kickstarter is the bigger crowdfunding platform and gets more press, but its fixed funding and limited product categories may limit your campaign. Indiegogo offers more product categories and ad analytics, but you’ll have to be careful when deciding whether or not to go with flexible funding.